Ogilvy have just launched a campaign to find the 'World's Greatest Sales Person'. So if you think you can peddle sand to Arabs or convince an Eskimo to buy snow, you may be in with a chance. Beware though, this is not a competition for your average 'Del Boy', Sunday market, car boot sale geeza. 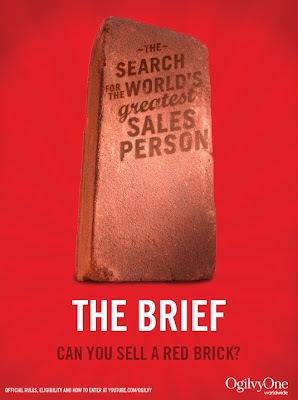 The challenge here is to sell a brick! The common everyday brick can be found almost everywhere. The brick was invented during the height of the Sumer empire between the 4th and 6th Millennia BC. In the 7,000 years since, mankind has made literally billions of them. However, they are still one of the most important things ever invented; the bona fide building blocks (pardon the pun) of civilisation. So what's the measure of success? You have several options of how you want people to respond so long as it is measurable. This could be by phone call, SMS, email, website or joining of a social network. Now the only question is: are you the world's greatest sales person? If you think you are then you need to make a 1-2 minute long video of your sales pitch and get it submitted to youtube.com/Ogilvy by May 16, 2010.